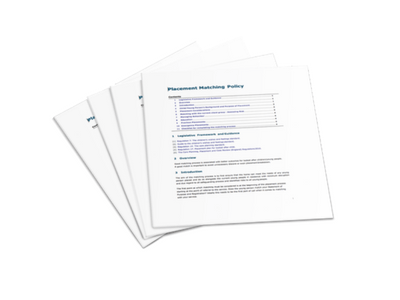 View cart “Placement Matching Policies and Risk Assessments” has been added to your cart. Safeguarding children is essential in the policy remit of any service working with Children and Young People. This ‘Done-for-You’ policy covers all the requirements essential to your safeguarding obligations and includes a flowchart of the steps organisations should take when reporting allegations of neglect and/or abuse. To further support your safeguarding arrangements we have included a ‘done for you’ Extremism and Radicalisation risk assessment and policy recently updated. Policy and Procedure – Policy and procedure to ensure your organisation is complying with the essential requirements when it comes to safeguarding children. Allegations of Abuse and Neglect Flow Chart – At a glance flowchart of the procedure all staff in your organisation should follow in light of allegations of abuse or neglect. Safeguarding Policy and Practice Checklist – A checklist to enable you to check your service has covered the essentials needed for your next Ofsted Inspection. This policy is informed by the legislative expectations of providers in line with the requirements laid out in Working Together to Safeguard Children 2015. We recognise that safeguarding is underpinned by two key principles. 1. Develop a culture of listening to children and taking account of their wishes and feelings, both in individual decisions and the development of services. 2. Follow safe recruitment practices for individuals whom the organisation will permit to work regularly with children, including policies on when to obtain a criminal record check. 3. Ensure staff complete safeguarding training that enables them to recognise signs of potential abuse and neglect. 4. Provide appropriate supervision and support for staff, including undertaking safeguarding training. 5. Have a designated professional to take lead responsibility for safeguarding children who will liaise with local statutory children’s services agencies as appropriate. This lead should also complete child protection training. 6. Ensure staff are aware of the indicators and types of abuse and how to respond. This policy and procedure pack contains all the essential requirements you need to meet including policy, procedure and reporting requirements. Documents are provided in word format to enable you to personalise with your own logo and designated persons. Easy to adapt and customise where necessary.